Brian Thomas Littrell (born February 20, 1975) is an American singer, songwriter and actor, best known as a member of the Backstreet Boys. 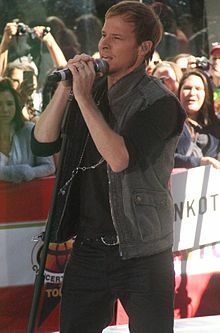 He is also a CCM singer and released a solo album, Welcome Home, in 2006. Brian has had five top 20 solo singles on the Christian charts in the US. On April 10, 2015, Littrell was inducted into the Kentucky Music Hall of Fame along with his cousin and bandmate Kevin Richardson. If I did not have my wife, I wouldn't be married, I wouldn't have the life that I have and I wouldn't have my wonderful baby boy who's not a baby anymore - he's going to be eight-years-old. Marriage can be work, it can be difficult, it can be hard, but I think working through those times makes you stronger as a couple and as a unit.